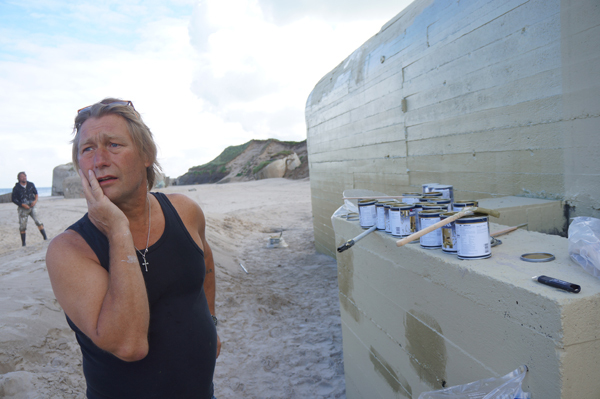 The making and presentation of gilded WWII bunker Gold Tooth (Guldtand) by Erik Peitersen at BunkerLove’s pilot project festival in Furreby by the Danish West coast, July 2012. Photos: Janne Fonda Graphics: Viola Heyn-Johnsen Production by me and set without rights to Savoy Truffle by the Beatles (wouldn’t mind a tailor-made, legal composition, if you have one, please!). Collecting to share more of their work, and will soon present further adventurous artists to these pages. 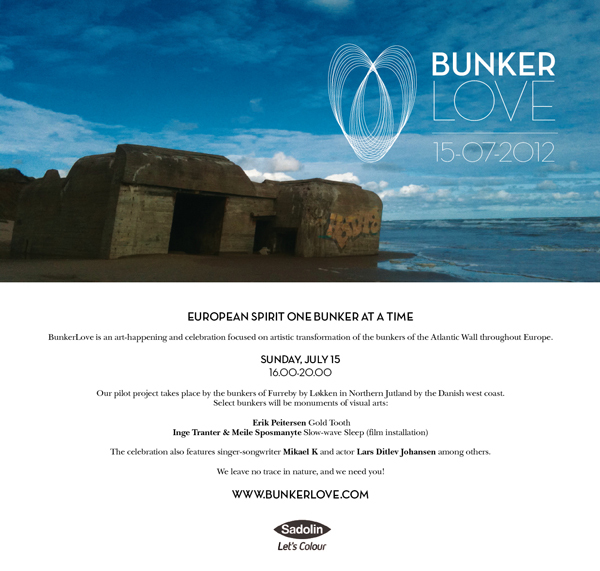 For rough idea about BunkerLove 2013, please see newsletter. 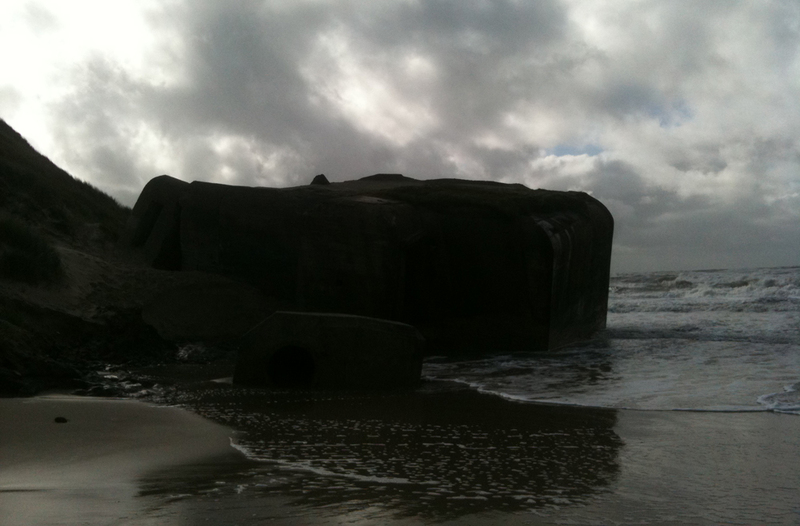 Visualization by Andrew James Zealey, bunker at Kærsgård beach in Northern Jutland. BunkerLove’s fourth newsletter explains where we’re at with venues and ideas for BunkerLove 2013. We’re feeling enthused by fruitful dialogues with artists, partners and members and will share it all… Your questions or comments are most welcome and you can Sign up for future newsletters here. Danish band Nephew made an ode to the North Sea named Hjertestarter (Vææææsterhav, kom nu og blæs mig i gang) and recorded their music video right where the BunkerLove festival was held (their mike). The song is about being deaf, dumb and blind and in need of the stormy ocean to get blown away. Tear down the old and useless to make room for more salt, more malt, more zest to the whole thing. 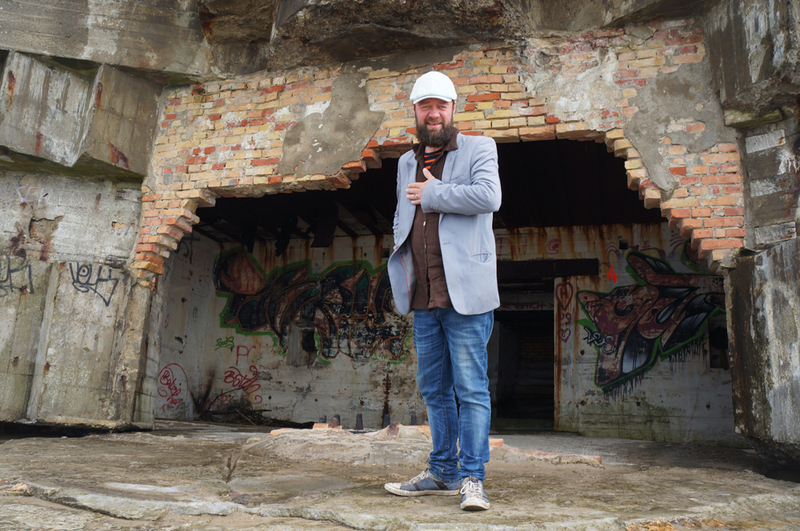 Playwright and actor Lars Ditlev Johansen’s exquisite BunkerLove speech in Danish. Thank you for caring and sharing, Lars! 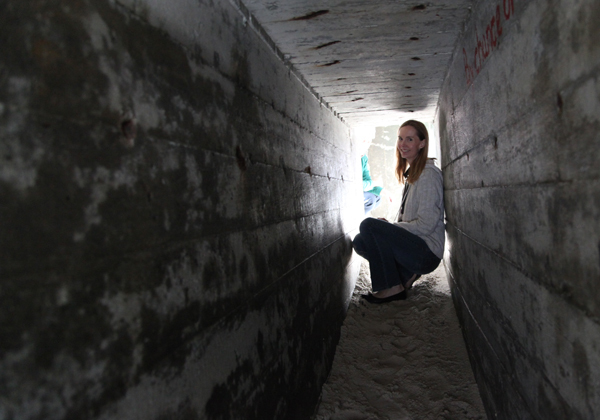 The bunkers are nothing in themselves. We approach them with humble steps and reverence. Afraid to wake the monster, because what if we woke up the little man with the weird moustache and the uncontrollable urge to raise his right hand and name himself “der Führer”. The demons are there in our own lives, perhaps in other forms and they grow meaner from being ignored. Let spirituality move us into our collective darkness to pull out the monsters and smother them with love and light. 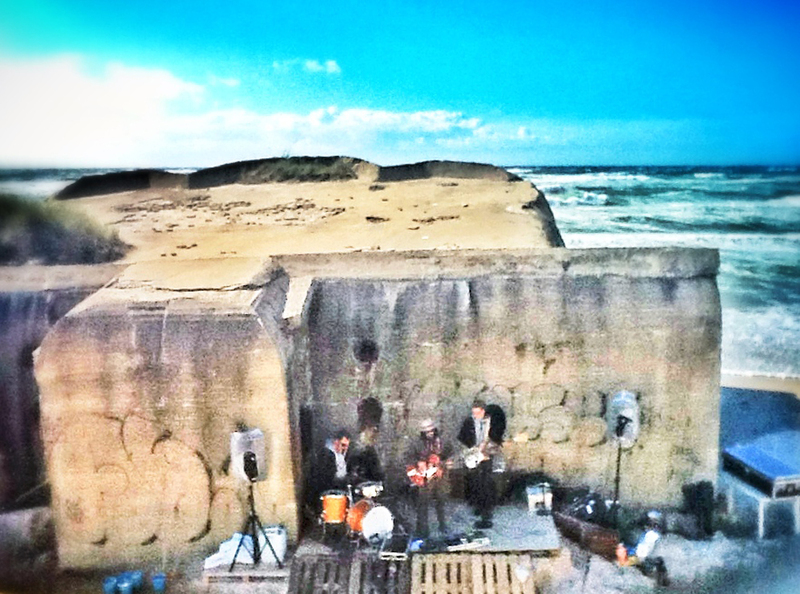 Klondyke gave a concert at BunkerLove 2012 and we could not have imagined a better beach band for our stormy premiere. THANK YOU Mikael K, Per Lange and Anton Johannes Hejl. Images here. 2 down, 13998 to go? First portion of photos from BunkerLove festival 2012 – more soon. 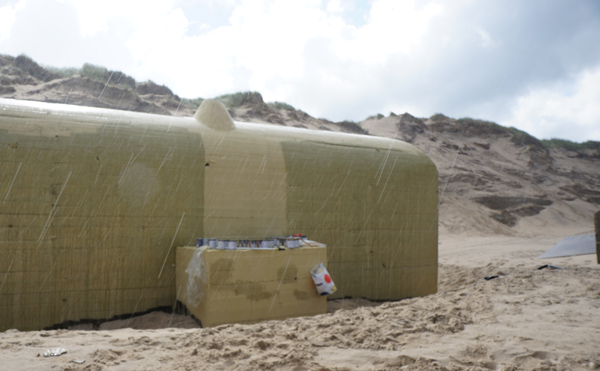 We’ll be moving around some sand today, and testing some sound, and get all sweaty before our bunker beach party starts at 16. Supposively sunny all day with some wind, so bring your bathing suit, a sweater and hat, and blankets to sit on. We’ll treat you to the little drinks we have, Fairbar sells drinks and you are free to bring your own food and drinks. 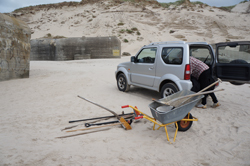 Please note that nearest toilets are 800 m along the beach towards Løkken. It’s great to park away from the beach, beware of the aesthetics and the tide. We will collect the thrash ourselves, so please make it easy by minimising trash and use the trash bins and blue bucket ashtrays that we’ve put up. See our most recent newsletter for practical information and sign up for news to hear how we roll on from here…. When BunkerLove opens at 16 tomorrow, it will be with a freshly painted Gold Tooth by Erik Peitersen. The rain demonstrated its powers this week where Erik and a team of volunteer assistants witnessed how the shine of gold paint can be messed with by a couple of heavy showers. As opposed to the past week, tomorrow should be dry, sunny and windy, and so that’s when we paint. Just in time for the gold to harden, so the gilded bunker can be used as BunkerLovers see fit. 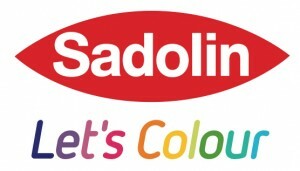 Thank you again to Sadolin, for being a great material sponsor. .. claimed Napoleon Bonaparte, and we agree on more than one level. We are happy that Århus-based Fairbar supports BunkerLove, by driving their movable bar named Flytbar på Facebook (Move bar/ movable in Danish) to sell delicious organic beers, coffee and snacks from their pictoresque café on wheels for our pilot festival. Like Bunkerlove, Fairbar is based on volunteer work and profits go to international relief work. In other words, you can spend your money on drinks with a great conscience. 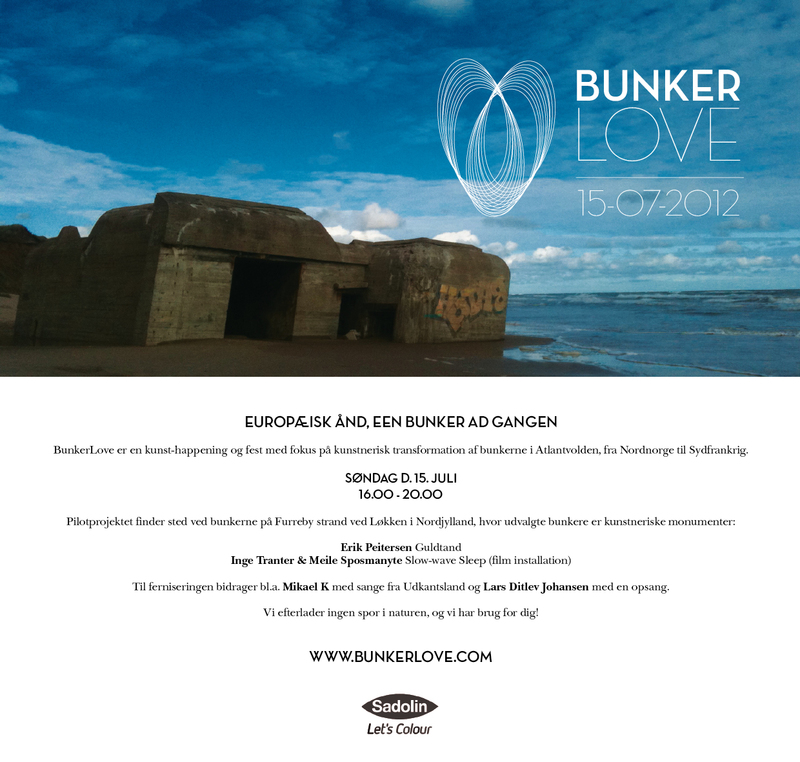 You are cordially invited to BunkerLove 2012 on Sunday July 15, 16-20. We rely on friends and luck to spread the word. Feel free to share these invites. Thank you! 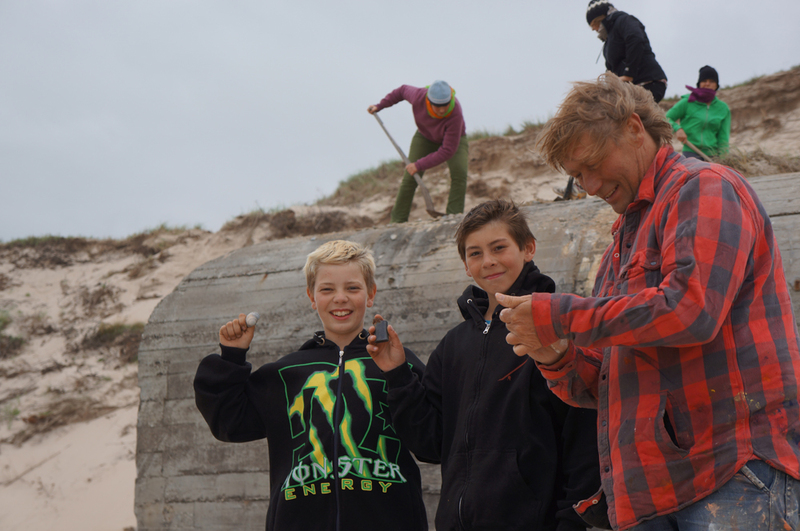 We are thrilled and excited to announce that Erik Peitersen will contribute to BunkerLove with a spectacular Gold Tooth. We are completely confident to promise a small miracle in the shape of a gilded bunker in between the rotten teeth of our joint history. In gums of sand it will rise as a subtle comment to the unconsciousness with which we accept symbols of war and irrational stupidity. 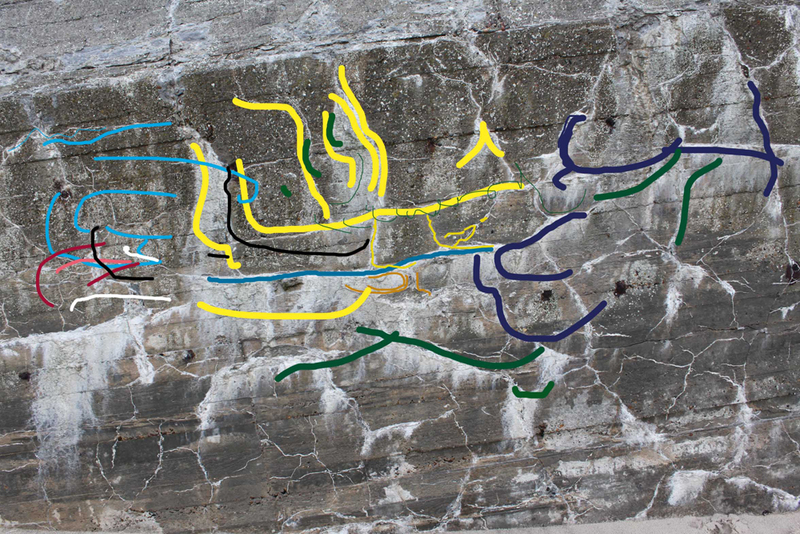 Erik introduces a new way of landscape painting that changes expression as often as the light, the dark, the tide and the people surrounding it. Peitersen brings to BunkerLove his wish to portray the constant change, beauty and brutality, the deconstructive powers’ symbiotic balance with the accidental sublimation and transformation. An attempt to capture the merging of before, now and after in one go. Materials for Gold Tooth is generously sponsored by Sadolin (Let’s Colour), and Erik will introduce it his very own way at Bunkerlove’s first festival, this Sunday July 15. Thank you Sadolin, and THANK YOU Erik – your work is a dream come true for BunkerLove! 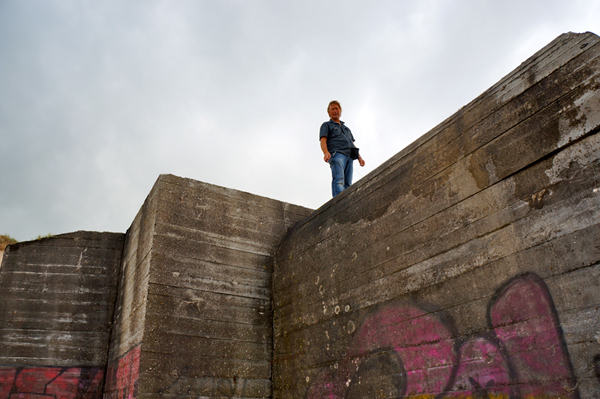 We are pleased to announce that multimedia artists Inge Tranter and Meile Sposmanyte have responded to the small niches in the bunkers, the tunnels, holes, nooks and crannies and the dark, secret spaces contained within the imposing solidity of the constructions. Their work for the bunker will consist of a projection of a person in a state of restless sleep. This will be projected onto the far wall of a small tunnel which was once part of one of the bunkers, but which has become slightly detached from the bunker itself. 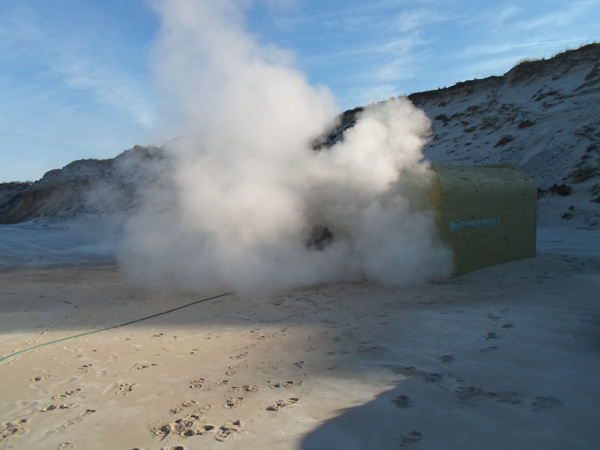 We are very grateful to Inge Tranter and Meile Sposmanyte for participating in BunkerLove 2012… THANK YOU. These are the voluptuous words of theater director, writer and actor Lars Ditlev Johansen. We are completely delighted that he has agreed to share his thoughts on facing one’s demons at our first BunkerLove Festival on July 15. Can’t wait! says Danish singer and songwriter Mikael K of Klondyke. We are THRILLED that he will play at the Bunkerlove Festival chill on July 15… Mark your calendar, and stay tuned! ‘I mit Nirvana’ (My Nirvana) is the opening track on Mikael K & Klondyke‘s most recent album: Udkantsland – sange fra skæve Danmark vol.1 (Fringe country – songs from crooked Denmark vol.1). THANK YOU!